Small Soldiers. Dreamworks Pictures 1998. So. Toys come to life. War toys are violent. This sounds familiar. But it has a cult following, it’s been praised for its writing, it has some familiar names I like, and I’m in the mood for a violent comedy right now. The marketing is entirely focused on the living toys, so I actually have no idea what the overall aesthetic of the movie is. I really want it to be stop-motion style toys in a live-action environment, but I expect I will be disappointed. For one thing, I want them to be in 12 frames per second, but that would clash with the live action as stupidly as the ED-209 did in RoboCop. Military contractor GloboTech acquires a toy company in order to put their resources to work getting money out of the consumer market. Unimpressed by disingenuous commercials depicting toys walking, talking and tearing out of their boxes when they can’t actually do that, the CEO orders that the line of Commando Elite action figures, and their enemies the alien Gorgonites, should actually be able to “play back”, and be on the market too quickly to do any product testing. The designers grab some advanced military surplus chips from GloboTech’s supplies and ship. Young Alan Abernathy talks the local supplier into giving him a set to sell in his father’s toy store while his father is out of town, and accidentally activates them early. He finds the Gorgonite leader Archer hiding in his backpack, and discovers not only that the toys are alive, but the Commandos have destroyed the store trying to destroy the Gorgonites, who only want to hide and learn about the world. Alan tries to contain this disaster, as his father, who barely trusts him to begin with, will in no way believe his story of killer toys that weaponize anything they can in order to attack allies of the Gorgonites. The style was very close to what I expected. I don’t think I’d come across anything that directly suggested this would be live action before. I think the toys were done with animatronics whenever possible and CG when not, and the result was fairly convincing in most scenes. The CGI was a little poorer than could have been hoped for, especially on the soldiers’ side, but they did a good job of using tricks to hide that. This is rated PG-13, and I didn’t really see justification for that until the third act, which starts with the Commandos convert a collection of “Gwendy” dolls into footsoldiers in a process that reminded me less of Frankenstein’s Monster and more of torture and brainwashing, the end results creepily disfigured. From then on, the antagonist toys feel actually lethal. The Gwendys swarm, and the Commandos use improvised flamethrowers, explosives, and chainsaws, and in the end manage to lay siege to a home. The obligatory romance between Alan and neighbor girl Christy feels a bit mismatched. It’s supposed to be a teenage romance, but Alan reads as two or three years Christy’s junior, at an age when that would put them in completely different worlds. She does rebuff him at one point saying she only dates older guys, but the shared crisis breaks that down eventually, even though it seems less like puppy love and more like having a crush on the babysitter. Complaining and nitpicking is easy, but I did actually like the movie. David Cross, Phil Hartman, and Robert Picardo are well-(type)cast in their minor roles. Tommy Lee Jones seemed like an odd choice for an action hero, but a hammy action villain is in his wheelhouse. The plot managed to surprise me at least once. The best part of the film is the humor, especially the scene where the Commandos’ leader stands in front of a (quilted) US flag and delivers a Patton-esque speech composed entirely of military cliches (“No poor sap ever won a war by dying for his country. He won it by being all that he can be”). If Dreamworks was mimicking Pixar with Antz for A Bug’s Life, Shark Tale for Finding Nemo, and Shrek for Monsters, Inc, this is clearly their Toy Story, and it was three years late because they were making it good. Wow, I loved this movie I actually wore my small soldiers bag in grade school and high school. Made me scared of toys for a little while but then I realized they wouldn’t come to life and that they were actually just toys. Great post! Great post! 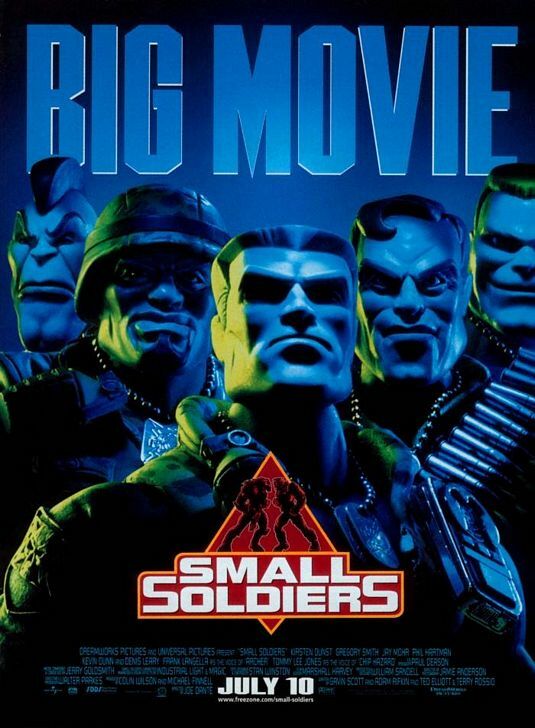 I remember loving Small Soldiers as a kid, but haven’t watched it in years. If you have time check out a post on my blog where we debate the best kids films from the ’90s. Small Soldiers wound up facing off against Matilda in the first round!